More than a year after the unity deal in Cairo, Fatah and Hamas still can't form a unity government. A senior Fatah official said on Sunday that his party and Hamas have yet to agree on the names of cabinet ministers in a joint administration of independent figures. Abbas and Hamas leader Khaled Mashaal were expected to meet in Cairo on June 20 to select cabinet ministers for the transitional administration, which is to sit for six months in the run up to elections, the report said. But Fatah office Secretary-General Amin Maqboul said that Egypt, the sponsor of last year's reconciliation deal to end the rival party administrations, was busy with its own presidential election, and thus no date had been set. Hamas and Fatah have led separate governments in Gaza and in the PA-controlled areas of Judea and Samaria since they split amid bitter fighting in 2007. 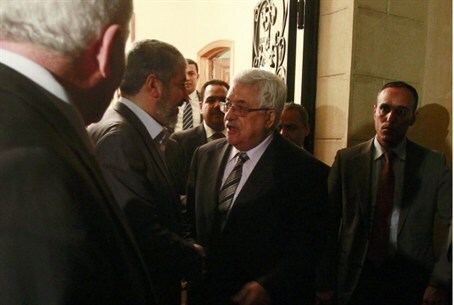 In May 2011, Abbas and Hamas chief Khaled Mashaal pledged in Cairo to form a government to prepare for elections within one year, but more than a year later, both parties have failed to implement the deal, with each side blaming the other for the impasse. Mashaal and Abbas met in Doha on February 6 and hammered out an agreement for the formation of an interim government of independent technocrats. Under the terms of the deal, Abbas was to serve as head of the interim PA government, ending a bitter dispute between the two sides over who would serve as Prime Minister. A meeting in Cairo between Mashaal and Fatah official Azzam al-Ahmed last month made no headway towards a unity government.